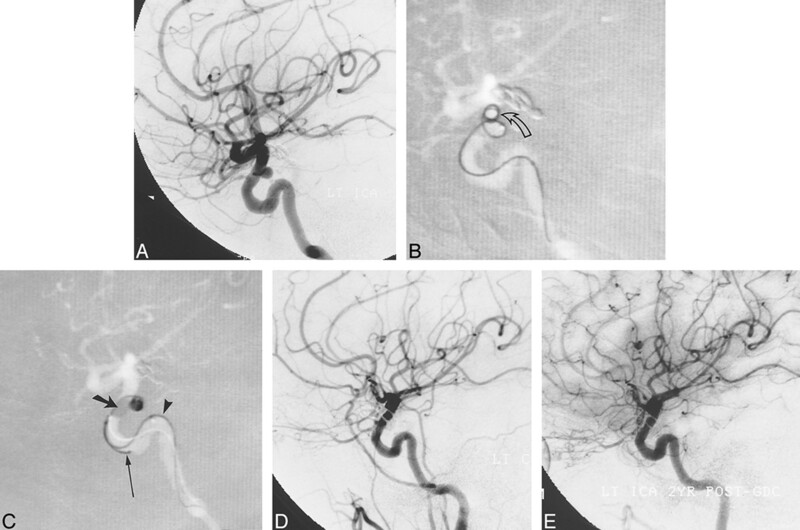 BACKGROUND AND PURPOSE: The management of broad-necked cerebral aneurysms by Guglielmi detachable coils (GDCs) is technically challenging owing to a variety of factors, including difficulty in defining the aneurysm/parent vessel interface angiographically and problems in achieving complete occlusion, later predisposing the aneurysm to regrowth/recanalization. We sought to determine whether the use of intraluminal balloons to remodel the parent vessel/aneurysm interface during GDC embolization would provide a safe means of improving the efficacy of endovascular treatment of broad-necked aneurysms. METHODS: Twenty-two saccular aneurysms of the internal carotid artery were treated with GDCs by using balloon remodeling techniques. All aneurysms were characterized by wide necks or were small with unfavorable neck/fundus ratios and required balloon assistance for coil embolization. Patients were followed up both clinically and angiographically. RESULTS: By using a microcatheter-mounted nondetachable balloon to provide a temporary barrier across the aneurysmal neck, we were able to deploy GDCs safely within a variety of aneurysms. Among the 22 patients treated, aneurysmal occlusion on follow-up angiography (mean, 19 months) was found in 17 of 20 patients (two patients died and no follow-up studies were available). Observed or suspected thromboembolic events occurred in four of 22 patients, resulting in one permanent deficit. Twenty of the 22 patients had good to excellent clinical outcomes. CONCLUSION: Although balloon-assisted coiling of cerebral aneurysms requires manipulation of a second microcatheter and an inflatable balloon, increasing its technical complexity, we believe that this method has utility in treating broad-necked aneurysms and small aneurysms that are otherwise suboptimally managed by conventional GDC deployment. Neuroendovascular management of intracranial aneurysms has undergone remarkable advancement with the development and widespread dissemination of Guglielmi detachable coils (GDCs) (1). Although early results have shown GDCs to be safe and effective in reducing symptoms related to aneurysmal mass effect and in decreasing the risk of rehemorrhage among ruptured aneurysms as compared with conservative management, some concern has developed over the tendency of partially coiled aneurysms to recanalize (2–4). Recurrence most notably has involved large and wide-necked aneurysms, and is associated with two technical problems: difficulty in angiographically defining and occluding the aneurysmal neck and difficulty in achieving suitably dense coiling of the neck/fundus transition zone. In a review of 79 aneurysms treated by GDCs, Zubillaga et al (5) reported stable complete occlusion in only 15% of wide-necked aneurysms as compared with 85% of aneurysms with small necks. In a more recent prospective study of 75 patients with acutely ruptured aneurysms treated by GDCs, Raymond and Roy (6) found that 7% of the aneurysms did not respond to treatment and 16% had residual filling of the aneurysmal fundus after embolization. The primary reason for unsatisfactory treatment in this study was a wide aneurysmal neck that thwarted acceptably dense packing of the fundus. It was further concluded that complete obliteration of the aneurysmal sac in ruptured aneurysms was essential to prevent subsequent rehemorrhage, which occurred in 5% of patients in this series. To facilitate treatment of broad-necked aneurysms, Moret et al (7) advanced the concept of balloon-assisted coiling (vessel remodeling), in which a small balloon-occlusion microcatheter is used to protect the parent vessel lumen during deployment of GDCs within the aneurysm. Other investigators have reported success with the use of this technique (8–11). In this article, we describe our experience with balloon-assisted coiling of 22 aneurysms of the internal carotid artery (ICA) and assess the stability of treatment during medium-term clinical and angiographic follow-up. Between December 1995 and September 1998, 60 patients with 64 aneurysms of the ICA were referred to us for endovascular management. Of these, 25 aneurysms had a neck size of more than 4 mm or a neck/fundus ratio of more than 0.7, and 22 of these required balloon-assisted remodeling of the aneurysmal base for treatment with GDCs. Patients comprising this cohort were entered consecutively into a registry and prospectively followed up with respect to angiographic and clinical outcome. Individually, the patients referred for endovascular treatment had been judged by different neurosurgeons to be at high surgical risk owing to poor medical condition or to specific features of their aneurysm, such as size, location, and complexity of surgical exposure (eg, cavernous sinus exposure, drilling of the anterior clinoid process). Patients ranged in age from 22 to 74 years. Nine patients presented with subarachnoid hemorrhage (SAH), six with headaches, and one with a third nerve palsy; six aneurysms were discovered incidentally. Surgery was attempted in four patients (cases 1, 3, 18, and 21), and embolization had previously been attempted unsuccessfully in two others (cases 9 and 19). Four patients had previously undergone neurosurgical clipping of other aneurysms. All procedures were conducted with the patient under general anesthesia. 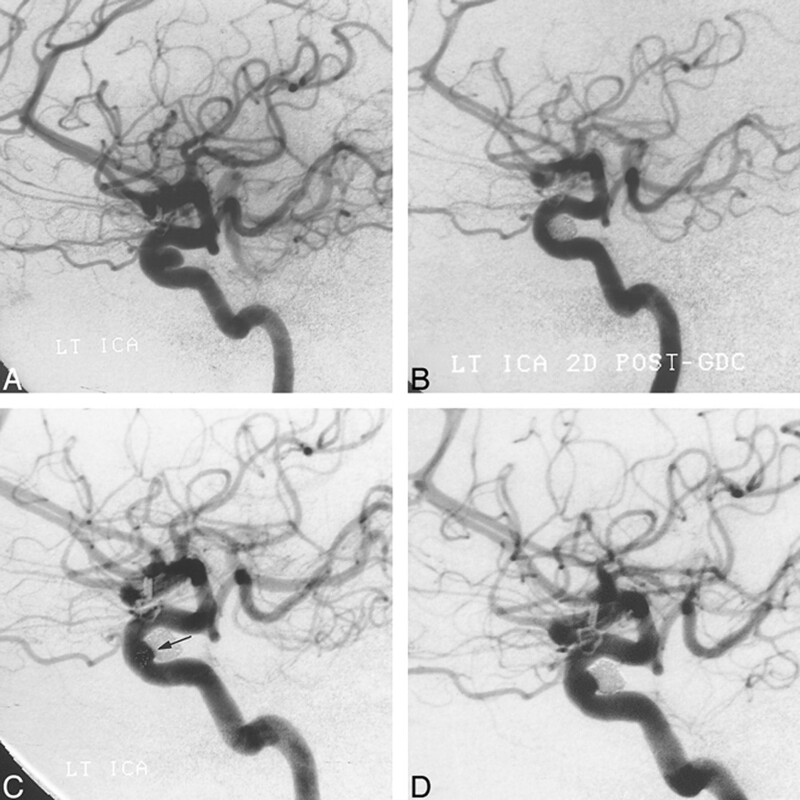 Cerebral angiography was performed to evaluate morphologic features of the aneurysm and parent vessel and the collateral supply to the vascular territory placed at risk by the proposed balloon occlusion, and to establish the optimal visual working projection for coil occlusion of the aneurysm. Microcatheterization was performed via one of two approaches. In cases 11, 14, 16, 18, and 21, the balloon and GDC microcatheters were introduced through the same 8F guide system, using single-groin access. In the remaining cases, bilateral groin punctures were performed, using two guide catheters for separate introduction of each microcatheter: a 6F sheath/guide catheter for the balloon, and a 5F sheath/guide catheter for the GDC microcatheter. Depending on the requirements of the specific case, a two-marker GDC microcatheter of 1.7F to 2.5F distal outer diameter was used to catheterize the aneurysm selectively. The nondetachable balloon microcatheters included the Endeavor (Target Therapeutics, Fremont, CA) in cases 1, 2, 11–22, and either the Grapevine or Cirrus/Solstice (Medtronic-MIS Corp, Sunnyvale, CA) in all other cases. Regardless of approach, once it had been ascertained that balloon assistance was required for optimal endovascular treatment, a balloon microcatheter, supported by an indwelling 0.010- or 0.014-inch microguidewire, was introduced and the balloon gently inflated within the parent artery across the neck of the aneurysm. The initial framing coil was then deployed through the intraaneurysmal microcatheter, after which the balloon was deflated and 1 to 2 minutes were permitted to elapse before the GDC was electrolytically detached so that stability of its placement could be ascertained. If no coil movement was noted, the coil was detached and the balloon reinflated before deployment of the next GDC. This cycle was repeated as necessary until the aneurysm was 1) densely packed, 2) treatment was completed, or 3) further balloon inflation was considered unnecessary for secure deployment of additional GDCs within the interstices of the coil frame. All patients received an intravenous bolus of 3000 to 5000 U of heparin just before balloon inflation, followed by intravenous infusion of 500 to 1000 U/h for the duration of the procedure to ensure the activated coagulation time was maintained at two to three times baseline. Treatment was followed by 24 to 48 hours of systemic anticoagulation with heparin to maintain partial thromboplastin time (PTT) at approximately twice normal value. Cases 4 through 10 received antiplatelet therapy with aspirin and/or ticlopidine for 3 days after the procedure. In two patients (cases 2 and 5), further anticoagulation, with oral warfarin, was extended for 3 weeks after the procedure because of the occurrence of thromboembolic events. Patient 15 received 1 million U of urokinase intraarterially during the course of the procedure for an angiographically identified occlusion of a distal middle cerebral artery branch. Aneurysmal occlusion by GDCs was graded as complete if no opacification of the aneurysm was evident on the posttreatment angiogram; as nearly complete if coils were present throughout the aneurysm but minor opacification was seen through the interstices of neck region coils on the immediate posttreatment angiogram or if a neck remnant smaller than2 mm was evident; or as subtotal if coils were not present in a portion of the aneurysm opacified on the postprocedure angiogram exceeding a neck remnant of 2 mm or larger. Twenty-two patients with aneurysms of the internal carotid circulation were treated endovascularly with a balloon-assisted method for placement of GDCs (Table). The aneurysms treated included one giant aneurysm (>25 mm in diameter), seven large aneurysms (10–25 mm in diameter), and 14 small aneurysms (<10 mm in diameter). All aneurysms exhibited either a large neck (Fig 1) or, in the case of aneurysms less than 5 mm in diameter, a large neck/fundus ratio (Fig 2). Twenty of the 22 patients underwent their most recent follow-up angiography between 12 and 30 months (mean, 19 months) after treatment. With the exception of patient 15 (Fig 3), all treated aneurysms judged as completely or nearly completely occluded on the immediate posttreatment angiogram (fully anticoagulated) were completely occluded at angiographic reevaluation (Figs 1 and 2). In patient 3, who underwent partial clipping and in whom aneurysmal occlusion was considered subtotal, residual aneurysmal filling was documented on the 19-month follow-up angiogram; however, aneurysmal growth was not seen. In patient 5, a 22-mm aneurysm with a 6-mm tubular neck could be packed only within 2 mm of the ICA. Sixteen-month angiographic follow-up showed no regrowth of the aneurysm and no coil compaction. No angiographic follow-up was available for patients 8 and 17. A and B, Frontal (A) and lateral (B) arterial phase images from digital subtraction angiography (DSA) of the left ICA show a large wide-necked aneurysm of the ophthalmic segment. C and D, Road-mapped live subtraction images of the left ICA (lateral projection) show placement of the first coil. Note the herniation of a coil loop (arrow) through the neck of the aneurysm into the left ICA (C). In D, the balloon (thick arrow) has been inflated across the aneurysmal neck, permitting the framing coils to be deployed within the aneurysm. Arrowheads identify the indwelling 0.010-inch guidewire within the balloon microcatheter. An unextruded segment of a GDC (thin arrow) identi-fies the course of the coil-delivery microcatheter. E and F, Frontal (E) and lateral (F) unsubtracted radiographs show deployment of a subsequent GDC. The images serve to orient the viewer with respect to the course of the ICA in relation to the aneurysmal base. The balloon (slanted arrow, E and F) has been inflated within the paraclinoid segment of the ICA, which sweeps lateral to medial across the face of the aneurysmal neck. The supraclinoid segment courses medial to the lower portion of the aneurysmal fundus and is partially obscured by the aneurysm in lateral projection. A small niche of aneurysm lying posterior to the ICA could not be angiographically thrown off the ICA by any of the views attempted. In this respect, the inflated balloon defines the boundary of the ICA lumen and assists the operator in coiling the aneurysmal base. The final segment of coil 14 (thin arrow, E) has been deployed in F. Note the alignment of the delivery wire marker with the proximal microcatheter marker (curved arrow, F). An indwelling 0.010-inch guidewire (arrowhead, E and F) identifies the course of the balloon microcatheter. G, Mid-arterial phase image (frontal projection) from the immediate posttreatment left ICA DSA after deployment of the 18th GDC within the aneurysm. Coils are present throughout the aneurysmal base; however, minor opacification through the coil interstices is evident. H and I, Frontal (H) and lateral (I) arterial phase images from the follow-up angiogram 18 months later confirm stable occlusion of the aneurysm. A, Arterial phase DSA image (lateral view) of the left ICA shows a small aneurysm of the superior hypophyseal segment. B, Several attempts were made to coil the aneurysm initially. Road-mapped live subtraction image of the left ICA (lateral projection) shows extrusion of a 4-mm × 8-cm soft 0.010-inch GDC (arrow). A subsequent attempt to place a 3-mm × 8-cm coil was likewise unsuccessful. C, Road-mapped live subtraction image of the left ICA shows deployment of a 4-mm × 8-cm soft GDC within the aneurysm during balloon inflation. The balloon (thick arrow) has been inflated across the proximal two thirds of the aneurysmal orifice, preventing coil herniation into the ICA and allowing coiling of the aneurysmal fundus. An indwelling 0.014-inch guidewire (arrowhead) and an unextruded coil segment (thin arrow) identify the balloon microcatheter and the GDC microcatheter, respectively. D, Posttreatment image from a left common carotid DSA, 3 days later, shows occlusion of the aneurysm. E, Mid-arterial phase image (lateral projection) from follow-up angiography of the left ICA at 22 months confirms stability of aneurysmal occlusion. A, Arterial phase image from a DSA of the left ICA (lateral projection) shows a small dural ring aneurysm with a broad neck. The aneurysm was occluded with five GDCs under balloon protection. B, Follow-up angiogram 2 days after treatment confirms aneurysmal occlusion by GDCs. C, A subsequent study at 8 months' follow-up shows a small recurrence (arrow) at the aneurysmal neck. D, Repeat angiography 24 months after treatment shows negligible change in the size of the recurrence. Clinical outcome was graded periodically according to a modified Rankin scale score (12) and Barthel index (13); mean clinical follow-up was 29 months. All patients had excellent clinical outcomes with the exception of three patients in whom the outcome was graded as good—two of these (cases 7 and 20) presented with SAH (Hunt and Hess grade 5) and one (case 1) suffered a nondisabling stroke as a result of treatment—and two patients (cases 8 and 17) who died. One of these (case 8) was a 65-year-old woman with severe chronic obstructive pulmonary disease who presented with SAH (Hunt and Hess grade 1) and died of cardiopulmonary arrest 5 months after treatment (no autopsy results were available); the other (case 17) was a 64-year-old woman who presented with SAH (Hunt and Hess grade 4) and died 1 week after treatment of complications related to her initial SAH. The only permanent complication accompanying the procedure was one minor stroke (case 1), which resulted in mild persistent weakness of the left hand. Two patients (cases 2 and 5) experienced single transient ischemic attacks in the immediate posttreatment period. One of these events (in case 2) was characterized by an atypical visual symptom. Both patients were given oral Coumadin for 3 weeks and had no further incidents. A single patient (case 15) experienced an angiographically recognized thromboembolic event during the coiling procedure and underwent intraarterial thrombolysis (1 million U urokinase) without clinical sequela. Additional complications of treatment included two groin hematomas (cases 5 and 8) and one pseudoaneurysm at the groin puncture site that required surgical correction (case 10). Since the introduction of GDCs for neurointerventional treatment of cerebral aneurysms in 1991, several reports (1, 3, 4) have attested to the safety of the devices and their efficacy, particularly in the treatment of saccular aneurysms with small necks. Unfortunately, for those aneurysms with a large neck size or unfavorable neck/fundus ratio, stable aneurysmal occlusion has been less successful, ranging from 15% to 35% at follow-up angiography (5). Wide-necked aneurysms present two primary challenges to treatment by GDCs. Often it is difficult with wide-necked or large complex-shaped aneurysms to delineate the vessel/neck interface confidently, despite multiple angiographic projections. Moreover, a mismatch between the diameter of the coil helix and the aneurysmal neck may lead to free herniation of the coil bundle into the parent vessel, increasing the likelihood of thromboembolic events or occlusion of the parent vessel. Both factors contribute to uncertainty in positioning coils at the aneurysmal orifice, frequently leading to undercoiling of the aneurysmal base. The long-term consequences of such subtotal treatment may be inferred from anecdotal experience in humans (6) and in experimental animals (14) with partially coiled aneurysms that suggests that inadequate coil packing of the aneurysmal neck increases the likelihood of recurrence. The factors responsible for recurrence (15) have not been studied exhaustively; however, they appear to involve coil compaction, remodeling of preexisting thrombus within the aneurysm, or true growth of the aneurysm, possibly facilitated by rearrangement of vector forces within the aneurysmal remnant. Nevertheless, the clinical implications of incompletely treated aneurysms are obvious. In a review of 403 patients with acutely ruptured intracranial aneurysms treated by GDCs, Vinuela and colleagues (16) reported a 2.2% rate of rehemorrhage at 6 months or more clinical follow-up. In that all repeat hemorrhages involved subtotally coiled aneurysms, which accounted for approximately 50% of the aneurysms treated, the rehemorrhage rate among incompletely embolized aneurysms may be restated as 4.4% (9/202), which is considerably greater than that observed for the set of completely occluded aneurysms in this series (0/201). Recently, several groups (7–11, 17) have advocated balloon-assisted coiling of wide-necked aneurysms (vessel remodeling), in which a small balloon-occlusion microcatheter is used to protect the parent vessel during deployment of GDCs within the aneurysm. In a review of their experience with 56 aneurysms in 54 patients in whom the balloon-assisted method was attempted, Moret et al (7) reported total occlusion in 22 (71%) of 31 patients undergoing follow-up angiography (mean, 12 months). Among the 21 aneurysms completely closed at initial treatment and at 3-month or more angiographic follow-up, stable angiographic occlusion was found in 20 (anterior and posterior circulations). Occlusion rates ranged from 73% on immediate posttreatment angiograms to 77% on follow-up studies, and were found to be dependent on the size of both the aneurysm and its neck. Although our cohort was smaller, our findings are consistent with these data. As indicated in the Table, stable angiographic results were achieved in 19 of 20 patients with aneurysms of the ICA. The frequency of complete or nearly complete occlusion at immediate posttreatment angiography with the patient fully anticoagulated was 91% (20/22). Complete occlusion at follow-up angiography (mean, 19 months) was found in 17 of 20 patients. Two patients could only be treated subtotally, and minor recanalization was found in one patient whose aneurysm was completely occluded in the immediate posttreatment period. 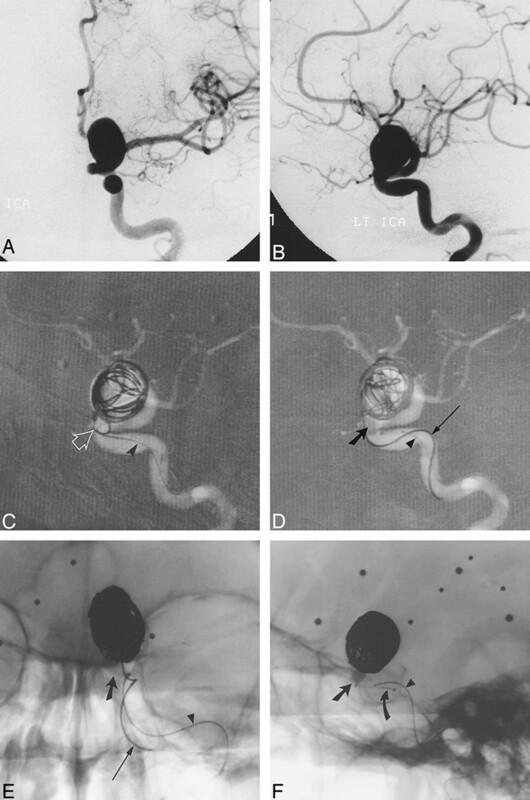 Considering the improved coil density and the rate of complete occlusion at follow-up angiography achieved with this method, our results and those of Moret et al (7) suggest that the effectiveness of balloon-assisted coiling in treating wide-necked aneurysms may approach that previously observed in small-necked aneurysms treated by GDC embolization (5). Moreover, the range of aneurysmal size and neck morphology represented in our patient population suggests an additional role for balloon-assisted coiling in the management of aneurysms that, because of their small size (<4 mm), are often difficult to treat initially with GDCs. The importance of total occlusion and dense GDC packing in achieving stable endovascular treatment of cerebral aneurysms has been observed in previous studies (5). Reul et al (18), using a rabbit bifurcation aneurysm model, proposed that recanalization of GDC-treated aneurysms reflects not only compression of the coil bundle but also rearrangement of individual coil loops, which exhibit a tendency to revert back to their original helical form, particularly at lower coil packing densities. Furthermore, these authors and others (15) have shown that development of a neointimal lining across the orifice of coil-treated aneurysms may require nearly ideal reconstruction of the aneurysmal neck, and even then appears to occur more slowly or less completely than previously assumed (19). If true in humans, anatomic cure of cerebral aneurysms by GDCs may be limited to conditions in which the coil scaffolding across the aneurysmal neck is structurally stable over the length of time required for neointimal repaving of the orifice. Several technical concerns pertain to this method. The increased number of guidewires and microcatheters necessary for balloon-assisted coiling add complexity to the technique, which may increase the risk of complications. Thromboembolic events were angiographically documented in two of our 22 patients and clinically suspected in two others. Three of these events were delayed, occurring after GDC treatment, and, therefore, not directly related to balloon manipulation. In two patients (cases 1 and 5), PTT values normalized prematurely, owing to inadequate heparinization, requiring reinstitution of therapeutic heparin anticoagulation. One patient (case 1) was left with a minor permanent deficit, characterized by mild left-handed weakness. Patient 2 experienced a fleeting visual “flashing lights” phenomenon several days after treatment and was placed on warfarin for 3 weeks without recurrent episode. Patient 15 experienced an angiographically recognized thromboembolic event during coiling and received thrombolytic therapy without sequela. Although the prevalence of proved and suspected thromboembolic events reported here exceeds that reported for aneurysms treated without remodeling (16), the significance of this difference is uncertain given the relatively small number of patients included in our series and the variability of thromboembolic complications reported by various groups (6, 16, 20). From a theoretical perspective, the increased surface area of exposed coils at the aneurysm/parent vessel interface required for complete occlusion of broad-necked aneurysms could serve as a nidus for fibrin strand and platelet aggregates, increasing the risk of thromboembolic events or parent vessel occlusion. The two remodeling series published to date, however, have not documented a significant increase in thromboembolic complications. Moret et al (7) reported thromboembolic events in 6% of patients undergoing GDC treatment by balloon remodeling, as compared with a frequency of 11% among patients treated by standard GDC methods. Likewise, Lefkowitz et al (8) reported two thromboembolic complications among 23 patients treated by the remodeling technique, which they believe did not significantly differ from the prevalence of thromboembolic events attending their conventional use of GDCs. Recently, Pelz et al (20) suggested that the prevalence of thromboembolic complications accompanying GDC treatment of cerebral aneurysms may be higher than previously estimated. In a careful review of 59 patients with 60 aneurysms treated by GDCs, they reported 17 thromboembolic events (28%) resulting in nine strokes (15%), three (5%) of which did not resolve. Nine of these events occurred in wide-necked aneurysms, suggesting that neck size is an independent risk factor for thromboembolic complications, regardless of GDC methodology. The risks attending balloon occlusion procedures are well documented and include vessel dissection, rupture, thromboembolic complications, and hemodynamic ischemia in patients with inadequate collateral reserve. While intracranial balloon angioplasty has been used extensively in the treatment of vasospasm, with acceptable complication rates, inflation of the microballoon in the vicinity of an aneurysmal neck is known to be associated with increased risk of vessel/aneurysm rupture (21, 22). Precise control of balloon placement and inflation is therefore paramount in using this technique safely. The use of an indwelling microguidewire (0.010 or 0.014 inch) was found to improve control over balloon handling and positioning dramatically. Furthermore, adequate angiographic road-mapping capability is essential in controlling the appropriate degree of balloon inflation in order to avoid vessel injury or rupture. The procedure may be performed through single-groin access using a 7F (0.78-mm inner diameter; Cordis, Coral Gables, FL) or 8F guide catheter or by using two guide catheters (5F and 6F) introduced through separate groin sites. Considering the increased number and size of guide catheters and groin sheaths, an increased likelihood of groin complications is not unexpected, particularly when using a regimen of 24 to 48 hours of anticoagulation. In our series, three groin complications occurred, two involving hematomas resulting from inadvertent removal of the indwelling groin sheath while the patient remained anticoagulated. While groin sheaths may safely be left in place during the 24- to 48-hour posttreatment period that the patient is anticoagulated, several devices—Femstop (Bard, Murray Hill, NJ), Prostar Plus (Perclose, Menlo Park, CA), and Vasoseal (Datascope, Montvale, NJ)—may be useful in reducing complications at the groin puncture site in patients who are uncooperative after the procedure or who have extensive iliac artery atherosclerosis and in whom it is desirable to remove the sheath before normalizing the PTT to avoid iliofemoral vessel injury or extensive hemorrhage. The duration of balloon inflation must correspond to the distal collateral supply to the occluded vascular territory to avoid development of cerebral ischemia during treatment of the aneurysm. We used burst suppression anesthesia and electroencephalographic monitoring to assess cerebral activity during temporary balloon occlusion in several early patients in whom a robust circle of Willis was not seen angiographically. From outcomes in these cases, it appears that there is little risk of irreversible ischemic injury, as long as balloon occlusion times are kept short (less than 5 minutes) during coil placement. In a retrospective review of 49 patients undergoing temporary occlusion of the middle cerebral artery during aneurysm surgery (a condition dependent on leptomeningeal collateral support), Lavine et al (23) concluded that a temporary occlusion period of 10 minutes or less was safely tolerated in the majority of patients. Furthermore, it appeared that pentobarbital, propofol, or etomidate administered at levels suppressing electroencephalographic burst activity provided significant neuroprotection as compared with the use of isoflurane alone. The risk of delayed coil herniation into the parent artery must be considered, particularly in those cases in which coils placed subsequent to the framing coil are deployed without further balloon protection. Our findings in this matter are consistent with those reported by Moret et al (7) and suggest the coils adopt a stable conformation within the restricted volume defined by the aneurysmal wall and the temporarily inflated balloon. A great deal of enthusiasm for the endovascular treatment of cerebral aneurysms has been engendered by the recent widespread availability of GDCs. Although early experience has supported the efficacy of the devices in many situations, as with any developing technology, certain shortcomings are evident. This is particularly true in the treatment of broad-necked aneurysms, which, as many studies have indicated, are associated with increased likelihood of recurrence after partial occlusion by GDCs. The results from our series of 22 patients with aneurysms of the ICA support the conclusions drawn by Moret et al (7) that balloon-assisted coiling of cerebral aneurysms is safe and efficacious, although technically more complex than standard GDC single-catheter methods. Further follow-up will be necessary to evaluate the long-term stability of balloon-assisted coil embolization and its ability to retard aneurysmal regrowth. ↵1 Address reprint requests to Peter Kim Nelson, MD, Department of Radiology, NYUMC, Room HE208, 560 First Ave, New York, NY 10016.